DJ Dirty Mollie is a woman of Steampunk living in Portland, Oregon. She has historically DJ’d for local conventions including GEAR Con and the sci-fi focused OryCon in her Steampunk persona, as well as having run the steampunk Whitechapel Circus Radio Show, among others, through KPSU. To find out more about Mollie and stay updated on her projects, you can visit her DJ Dirty Mollie Facebook page or the page for the Whitechapel Circus Radio Show, or find her at GEAR Con this year! How would you define or describe yourself/your character? DJ Dirty Mollie is a tomboy Steampunk mechanic who ran away from home to get away from Victorian England's social stratification and arranged marriages to do her own thing and follow her heart and dreams. She loves machinery and tinkering and engineering and trains and airships and music. After many misadventures she somehow managed to land a job tending Dr. Liam O'Malley's Whitechapel Circus, aka the Whitechapel Circus Radio Show, and the rest, as they say, is history. How did you find Steampunk and how do you define it? On a subconscious level, I knew I loved Steampunk without knowing what it was from the moment I first saw Disney's "20,000 Leagues" when I was about 10 or so; but I didn't really find "Steampunk" as a subculture until I came across the very first run of "Girl Genius" by Phil & Kaja Foglio in my local comic shop when they were still doing the original monthly issues, and I started reading around issue 8 or 9, and I realized that "gaslamp fantasy" was finally going to become a larger, sustained subculture and genre. That was back around 2004 or 2005 I think? And I've been into Steampunk (in essentially its current form) ever since. To me, Steampunk is easy to define and hard to define at the same time; it's an aesthetic, with Victorian stylings and scientific ideals merged with contemporary social mores and norms, reimagining a lot of "what if?" ideas. 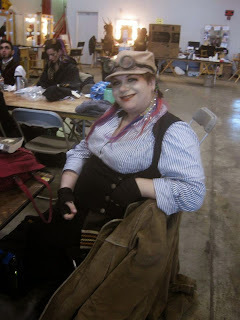 I don't feel there's any specific "right" or "wrong" way to be a steampunk, because there's so many facets and areas to enjoy, whether it's making stuff, the science, a love of Tesla, the fashions and costuming, role playing, the music, or anything else that makes up the stuff Steampunks like and do. Describe one of your creative processes in what you do. Putting together an episode of Whitechapel Circus takes about 8-10 hours of prep time per show or more. When I'm doing the show, I have to be constantly looking for new music because I don't want to keep playing the same songs over and over again, even though many songs are considered "staples" of Steampunk music or favorites that we love to hear. I spent a lot of time in Steampunk communities, listening to other shows and DJs, reading music blogs, reviewing and listening to new CDs sent to me by bands and artists or CDs sent to the radio station, trying to find hidden gems masquerading as "folk" or "bluegrass" or "country," hopping all over Spotify from artist to artist, using "sounds like" recommendations to find similar artists, and then compiling all of that music into a collection, listening and reviewing it, deciding what I like and what sounds good or sounds Steampunk to me, what I think my audience would enjoy, and then putting together a two hour playlist of music for a single show. There is a lot of work, editing, listening, culling, and mixing efforts that goes into a single episode of the Whitechapel Circus. The original inspiration for the Whitechapel Circus came from Emmett and Klaude Davenport—the original Davenport Sisters who started the Clockwork Cabaret. 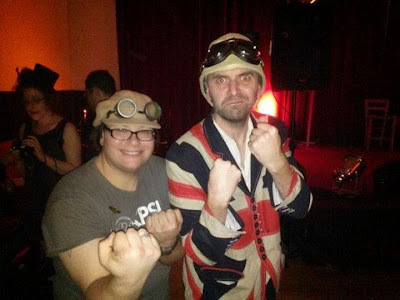 I would listen to their show, which introduced me to so much new music, and I'd hear how they had Clockwork Balls and Steampunk events, and I was jealous that I couldn't attend anything. At the time, I was living in Northern Illinois and Clockwork Cabaret was broadcasting from North Carolina. After I moved to Portland and saw that there was already a very large Steampunk community here, I decided that I would do something along those lines because nobody else was, and thus, Whitechapel Circus was born. Captain Robert and Abney Park was a very big influence as well, because a lot of the messages in Abney Park's songs spoke to me following my own dreams and taking the chance to do something I loved that made me happy instead of doing things that I hated for money. I'm inspired by a lot of people, and I feel like so many other people are doing so much more awesome things than I am, that I couldn't name all of them here. 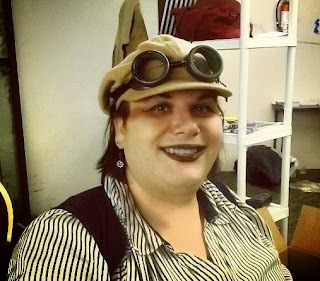 Every person I've met in the community though has inspired me though in some shape or form, and I appreciate all the friends and family I've made as a Steampunk. Tell us about one of the projects you're working on (or just finished). Most of my projects have been on hiatus for the last year or so due to real life concerns. However, before my hiatus, I was hosting the Whitechapel Circus, the KPSU Night Shift (a goth/industrial radio show) Air Raid Radio (a post-apocalyptic radio show) and occasionally, Wherehouse Radio (an urban folk show). Most recently, I've been working to try to put together a post-apocalyptic outdoor festival somewhere around Portland because I feel a lot of cross-popularity between Steampunk and post-apocalyptica as subcultures, and p-a is very big right now with not a lot being done for it. However, I'm also hoping to bring back Whitechapel Circus in some form sometime later this year. Of course, there's also Portland GEARCon that I work with as well; and I will be working with GEARCon this year as Operations staff as well as DJing Vanity Thorne's Vaudeville Vixens burlesque performance there on Sunday evening. What advice do you have for young/new Steampunks? Find what you like and do it! Don't let someone tell you "That's not Steampunk" or "That's not authentic" or "You're doing it wrong." Steampunk started out as a literary genre, it's all fictional, speculative, and supposed to be fun. Sure, there might be some general guidelines most steampunks follow, but if we're all playing a big game of "what if?" together, than your "What if?" is just as valid as someone else's "What if." Tell us about a project you'd love to start! I'd love to film a Steampunk movie or web series. In the "real world," my educational background is in film production, but between real world time, creativity, and budget constraints, the opportunities to begin such a project just haven't quite materialized yet. Talk about what you like about your involvement in the Portland Steampunk community/the Steampunk community at large. The people I've met, and the activities I've participated in! I've gotten to meet and hang out with Abney Park, Aurelio Voltaire, numerous local artists like Vagabond Opera, the Wanderlust Circus, Three for Silver, Professor Elemental, Sir Poplock Holmes, Lord Montague J Fromage III (aka SteampunkFUNK Bizarre), being on "Grimm," getting auctioned off for a date at GEARCon (and getting 'bought' by Captain Robert for a brunch date,) going to concerts, conventions, riding on steam trains, and just generally enjoying fun times with great people! DJ Dirty Mollie will return to the airwaves and interwebs sometime this year! Promise!